I went to the store with an actual plan and a list! I feel so organized when I do that. Okay, it’s not a great plan, but it’s pretty good. It’s better than no plan. I am trying to actually make some more of the recipes I have bookmarked on my computer, rather than marking them and forgetting about them. How do I get so behind here? It’s all that time spent reading…. I loved this at the beginning and the end, but the middle dragged a bit. It didn’t end the way I thought it would, which is always a good thing. I liked the way the book used people in the past and the near future/present to demonstrate that even at our most advanced, people have prejudices and biases that they are not aware of–bits of knowledge that we think are already decided, so we do not investigate any further. Very interesting book. The book itself, though, was really excellent, as usual. The characters were wonderfully drawn, as usual. The mystery was satisfying, and the personal quirks of all the detectives were interesting as well. In the hands of a skilled and disciplined writer, having a series with ongoing characters allows for gradual character development and growth without spending a lot of time away from the main story (as an aside, ihat’s one of the reasons I keeping reading those J.D. Robb books–she does that well). Nothing earth-shattering in here, but it is a good reminder. I like the way Walsh adresses the underlying issues for both clutter in our homes and on our bodies. It’s a good reminder. Great stories, wonderful essays about Octavia Butler and Ursula K. Le Guin that made me tear up, and a Tiptree story. Just wonderful. This book was about religion as much as it was about first contact with an alien species. It was also about how difficult first contact situations are, and how much information you need to absorb very quickly, and how easy it is to get everything tragically wrong. I really enjoyed this book, although it was very difficult. I will probably read the second book at some point, but not for a while. I found it hard to believe that this was Russell’s first novel–the writing was very mature. Very good book. The mystery was intriguing, but also, the commentary on the people’s lives was fascinating. Did Olive commit the crime she confessed to (killing her mother and sister and chopping them into pieces)? If she did, how much culpability does she really bear? Rosalind Leigh, the author who undertakes to write a book about Olive against her will, is an intriguing character as well, who convincingly works through her demons at the same time that she investigates Olive’s. I will definitely be reading more of Walters’ books. Excellent book. I liked the way that Vincent confronted her pre-conceived notions with an open mind and was really willing to learn. It was a very difficult process for her, obviously, which was interesting to read. Wonderful. I loved this book so much, I read it very quickly. I loved the characters, and the end was fantastic. I am so glad I got this book, based on many recommendations from the 50 Book Challenge board on LibraryThing. I am working on You: On a Diet, and then I am tackling War and Peace. I have read long books before, but this one is intimidating me a bit. And, it’s not going to good things to my pace! It will do wonderful things to my average page count statistic, though, so I should not complain. Last night, when we had guests over for dinner, this was baja tempeh tacos in blue corn tortillas, with red cargo rice and black beans with adobo sauce on the side. For lunch today, I threw the whole thing in a bowl, minus the tortilla. It was delicious both ways, which isn’t a shock, because I got the recipes from Veganomican, which hasn’t let me down yet. The marinated tempeh was amazing, and the slaw and lime crema were the perfect complements. I loved the recipe for the black beans with adobo sauce, because the beans were nice and bland, and the sauce was nice and spicy, with lots of flavor. Since the recipe called for adding the sauce at the table, it was the perfect dish to share with people with a wide variety of tolerance for hot, spicy food. 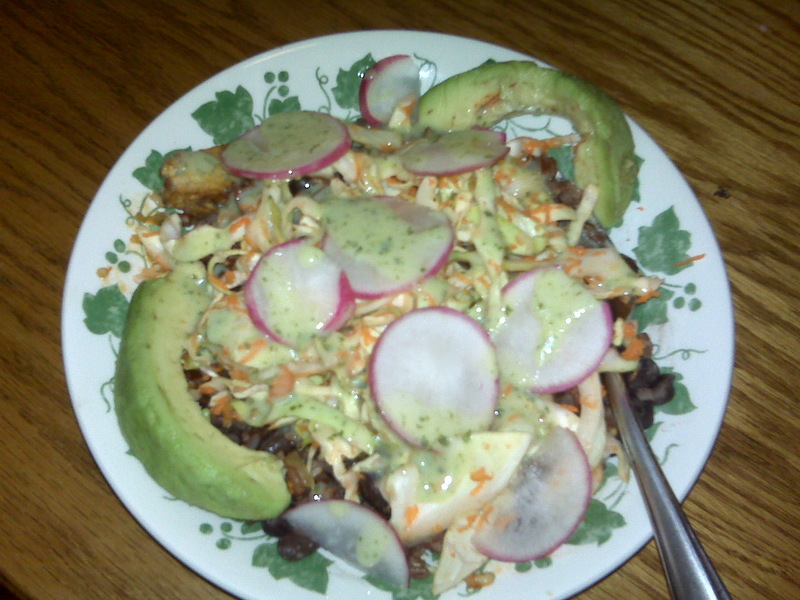 I garnished with fresh radishes, avocado and orange tomatoes, although there weren’t any tomatoes left to garnish my leftovers. The radishes came fresh, still attached to the greens; I find they are so much better than the blandly hot radishes that come in bags from the big food processors. I would have thought that bland and spicy don’t go together, but those just taste hot without any flavor to go with it to me. This was a very successful meal with guests, and something we will definitely be having again! Another great book from James. Very suspenseful at the end–I kept having to go back and actually read a paragraph that I had only hurriedly skimmed. A few years ago, I lost a bunch of weight. I didn’t follow any particular pattern of eating, ie. Weight Watchers, Atkins, etc. I had some simple rules around the way I ate: I only ate food that I really enjoyed. I tried not to choose fattening foods very often, but when I did, I enjoyed them and didn’t feel guilty about eating them. I ate slowly and really paid attention to how full I felt, and the the taste and enjoyment of my food. I cooked real foods at home as often as possible, and kept lots of whole fruits and veggies on hand for occasional snacks. I avoided processed food as much as possible. I ate at the dinner table with my family and friends. I lost so much weight, that I really started to pay attention to the way that I was eating, the specific foods. I joined Weight Watchers, and I counted points. I lost five more pounds, but I was anxious about food a lot. I was also hungry. I spent a lot of time thinking about food, and I didn’t enjoy what I was eating. I bought little chocolate cakes, put out by Weight Watchers at only one point that tasted a lot like chocolate sawdust, and told myself it was a treat. I then started gaining weight. Now that I have read this book, I can see the clear differences between the two styles of eating. When I focused on eating real food and enjoying eating, I lost weight, without putting much effort into it. When I focused on losing weight, I thought about food all the time, I didn’t enjoy my food, and I gained weight. This book was helpful in reminding me of my own experiences with food and weight, and showing why things happened that way. It was short book, but very interesting, and full of information. Highly recommended. This book had a lot of interesting information about the increasing complexity of popular culture, and the positive affects on our intelligence. Johnson certainly does not say that sitting around playing video games and watching tv all day long is good for us, but he makes a convincing argument that doing these things sometimes can be good for us. He cited an impressive amount of research to support this theory, although much of the justifications for his view are more theoretical than proven at this point. It does open up quite a few interesting questions for further research, though. I stayed up too late to finish this one. It was just as good as I remembered. I found the Historical Notes at the end particularly creepy, when the academics studying the supposed manuscript go out of their way to talk about how the oppression of women in the Gilead society is part of a different culture, so they cannot make value judgments about it. So many people say that now about cultures that viciously oppress women, as if that makes it all right to conduct activities like honor killings, or punishing women for adultery when they were raped. I have been listening to NPR lately about how Germany refuses to uphold their own laws when it comes to crimes against Muslim women because that is a different culture, so this is not a fictional device. Scary stuff. Excellent book, I am glad I read it again. I needed something easy to read, because I was sick, and this fit the bill. The eye rolling quotient of these books is high (Eve Dallas is tougher than you, no matter who you are), and there is no interaction between characters that goes unexplained, but the mysteries are fun, the characters do grow and change, and I really enjoy these. This was just a lovely read about reading can change anyone, even the Queen of England. This was the most recent book that my 10 year old daughter and I read aloud to each other. We both cried quite a bit near the end of this. We are going to get the other books in this series. It was a great book for talking seriously with my daughter while still being very enjoyable.